Somewhat remarkably, just one horse trained by Kiaran McLaughlin was nominated the 2019 Triple Crown. But for having a single chance to enter battle with, the stable could do worse than Haikal (Daaher), who looks to punch his ticket to the GI Kentucky Derby in Saturday’s GII Wood Memorial S. at Aqueduct. 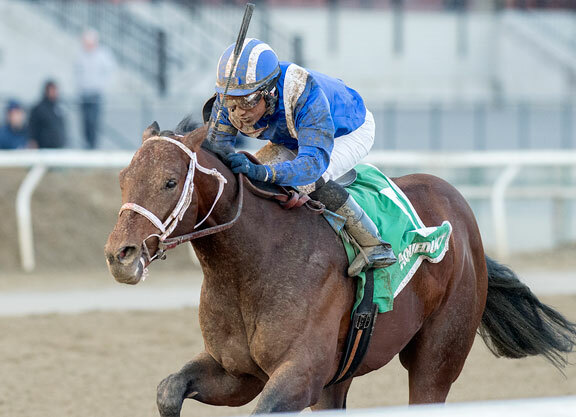 A homebred half-brother to the mercurial ‘TDN Rising Star’ Takaful (Bernardini), Haikal closed fast to just miss in his seven-furlong debut Nov. 10, then came got home in :24.07 to graduate by a neck in a six-furlong maiden Dec. 15. That same tenacity and determination was on display when proving a head best in the Feb. 9 Jimmy Winkfield S., setting him up for the GIII Gotham S. stretching out to the one-turn mile Mar. 2. Well back behind a cracking pace, Haikal looked to have it all to do even as deep into the race as the final furlong, but he hit another gear and raced over the top of his rivals to best ‘Rising Stars’ Mind Control (Stay Thirsty) and Instagrand (Into Mischief) by a widening length. The conditioner acknowledges that Saturday’s nine-furlong trip is a bit of an open question, but that no conclusions should be drawn through the single-minded and tempestuous Takaful. McLaughlin is optimistic–if not 100% certain–that Haikal, whose paternal grandsire Awesome Again won a GI Breeders’ Cup Classic and whose damsire Distorted Humor was responsible himself for a GI Kentucky Derby winner, will thrive at Saturday’s journey and beyond. McLaughlin went agonizingly close to winning the Derby when Closing Argument (Successful Appeal) was just outfinished by Giacomo (Holy Bull) in 2005. Add that near-miss to his long and fruitful relationship with Sheikh Hamdan and it’s clear McLaughlin relishes the opportunity at hand. Though he has trained two Triple Crown winners in the span of four years and though his two best chances this season-arguably-lost their undefeated records in separate divisions of the GII Rebel S. Mar. 16, trainer Bob Baffert is welcoming the chance at another run at this year’s Classics. Game Winner has done well since his loss at the hands of Omaha Beach (War Front) and indicated his readiness for Saturday’s GI Santa Anita Derby with a six-furlong work that was timed in 1:13.40 (1/11) Apr. 1. A repeat of his last, win or lose, would be just fine with Baffert. 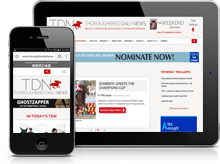 Speedway Stable’s Roadster (Quality Road) is yet another of the Baffert gaggle of ‘TDN Rising Stars’ and he gets his crack at a Derby berth at Santa Anita this Saturday. Third to Game Winner as the odds-on favorite in last year’s GI Del Mar Futurity, the $525,000 Keeneland September purchase returned to the races with a strong 2 1/2-length victory over the well-regarded Nolo Contesto (Pioneerof the Nile) in a one-mile allowance Mar. 1. He worked a bullet six panels in 1:12.60 (1/19) Mar. 31. Baffert added that ‘Rising Star‘ Dessman (Union Rags) was under consideration for Saturday’s Wood Memorial, but would pass the race after working only fairly (6f in 1:14.80) Apr. 1. “His work was nice, but I was looking for something over the top, so I’m just going to wait a little bit on him,” he said. Much Better (Pioneerof the Nile), fourth after setting a fast pace in the Gotham, cuts back to seven-eighths for Saturday’s GIII Bay Shore S. at Aqueduct. Despite the flurry of activity coming over the next several weeks, the recent events in California have weighed heavily on Baffert’s mind, and he took a few minutes to reflect on the situation. “We’ve been under this dark cloud and hopefully we can move forward,” he said introspectively. “It’s supposed to be fun. This is our version of ‘March Madness.’ There’s been a lot going on here, unfortunately, in California, we’ve been getting beat down pretty good. But you know what? It’s a beautiful sport, people don’t really understand it. We’ve had some bad luck here and it’s very unusual what’s going on.